It’s about one month before pitchers and catchers report, and it would seem that the Mets are still in the market for free agents to plug a few holes. Perhaps a reserve outfielder who can handle centerfield, for one (though they appear to have come to an agreement with the great Willie Harris), and hopefully a few more arms for the pitching staff. Though, it’s possible the Mets don’t sign anyone of significance in the next 30 days, meaning there won’t be much to complain talk about. Let’s be serious — if the Mets “big” signings this winter are Ronny Paulino, Chris Capuano, D.J. Carrasco, and Boof Bonser, it’s unlikely they’ll acquire more exciting than that group in the final month before pitchers and catchers report. First, because there simply aren’t many interesting players available, and second, because Sandy Alderson has no threads left in his shoestring budget. That said, what we’ll do from here on in is count down the days to spring training by remembering random players from the past who wore the uniform number of the current count. This idea was 100% inspired by reading the book Mets By The Numbers (as well as the MBTN website). So for example, today is 30, so we can remember Nolan Ryan, Mike Scott, Cliff Floyd, Dennis Ribant, Aaron Sele, or one of the many other once-Mets who wore uniform #30. But which one should we focus on? Ryan and Scott represent painful memories — the two aces that “got away”. Granted, at the time he was dealt for Jim “friggin” Fregosi, Ryan had issues with blisters and bases on balls, the Mets were loaded with young pitching, but light on offense, so there was a tiny hint of logic in the move. Had Ryan stayed, the Mets’ rotation of Seaver, Koosman, Ryan, and Matlack would have compared to the 2011 Phillies’ — but for all we know, it would have simply resulted in more 2-1 losses and the same amount of third-place finishes; their offense was THAT bad. Scott stunk as a Met — he was so bad, getting Danny Heep in return seemed like a steal. It wasn’t until Roger Craig taught Scott how to scuff the ball for more movement throw a split-fingered fastball that he became dominant. Aaron Sele holds a special place in the Mets bullpen; for all we know, he’s still sitting down there, right now, playing cards and waiting for Willie Randolph to call him into a game. Ribant might be a good player to focus on, since he was the very first Mets starter to finish a season with a winning record (11-9 in 1966). Such a feat represents hope. And it is spring training that hopes eternal … er … or something, right? So for me, the perfect former #30 to focus on right now is Jackson Todd. Some of you younger fans likely have no idea about Jackson Todd — and that’s a shame; just another example of stories that disappear because they didn’t happen after Al Gore invented the internet. I remember him well for two reasons: first, because I always wondered if he was related to Jets quaterback Richard Todd (he wasn’t), and second, because he had to beat cancer before beating the San Francisco Giants. Todd was a spectacular pitcher for the Oklahoma, making second-team Big Eight as a freshman and All-Conference as a sophomore and Junior. He threw 14 shutout innings in the 1972 College World Series and his 13 complete games in 1973 remain a Sooners’ record. The Mets plucked him in the second round of the ’73 draft and pitched well in the minors, looking like he’d be yet another great arm developed by the organization. 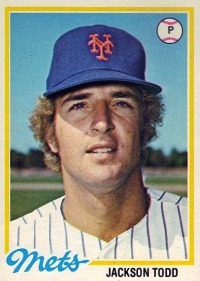 However, malignant lymph node tumors were found in Jackson Todd‘s chest after the 1974 season. Surgery was required to remove them, and doctors gave Todd a 10 percent chance of survival. He went through 9 months of chemotherapy and the cancer went into remission. Remarkably, Todd returned to pitch in 13 games at AA Jackson in 1975, and then hurled a full, cancer-free season at AAA Tidewater in 1976, going 13-9 with a 2.91 ERA. He was promoted to the Mets in May, 1977 and made three appearances out of the bullpen before making his first Major League start at Shea Stadium on May 19 against the Giants. Todd allowed only three runs on seven hits and a walk and struck out five in 7 2/3 innings to earn the victory. His lone mistake of the ballgame was a hanging curve that Terry Whitfield knocked over the fence for a three-run homer (the scouting report insisted that Whitfield couldn’t hit the deuce). Luckily for Todd, John “The Hammer” Milner and the recently acquired Lenny Randle (available because he had beat up his manager in Texas) also hit homeruns and fireman Skip Lockwood struck out 3 of the last 5 batters of the ballgame to seal the victory. Todd only won two more games in ’77 — his only year as a Met — and was traded a year later to the Phillies for minor-league utilityman Ed Cuervo (no relation to Jose). Eventually, Todd found his way back to the bigs with the Toronto Blue Jays, appearing in 64 games from 1979-1981. It was hardly a spectacular career on paper, but to me, Jackson Todd‘s journey from near-death to a near-shutout in the big leagues was more inspiring, powerful, and spectacular than the playing careers of most other MLBers. And that’s why I chose Jackson Todd and his uniform #30 to commemorate today — his story is one of hope realized. Fitting, isn’t it, for spring training? I became a Mets fan in the mid-70’s as a pre-teen and recall the name Jackson Todd but I either forgot or somehow missed the beating cancer aspect of his life. Kudos to him for overcoming 10% odds of survival period let alone pitching professionally again. Like you, I was a pre-teen in the 70s and became a Mets fan during that time. The Jackson Todd story was endearing, but fleeting — he only spent that one half-season with the Mets so it was easy to miss it. I think the only reason I remember it is because I happened to have both his baseball card and the football card of Richard Todd and felt certain the two had to be brothers, since they both used their arms and both had blond hair … but that’s the way an 8-year-old thinks, I guess.